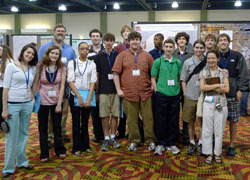 Durham Academy (Durham, N.C.) students at the 2009 Lunar and Planetary Science Conference. Approximately 100 students at nine high schools and one college are busy getting acquainted with Mars exploration and preparing to analyze CRISM data as part of the Mars Exploration Student Data Teams (MESDT) program. After a few years of beta testing, during which a limited number of schools participated and software and methods were tested, MESDT is now open to nationwide participation. The teams represent schools in Arizona, California, Georgia, Michigan, Missouri, New York, North Carolina, Ohio, and Wisconsin. Some teams are made up of entire science classes, while others have formed groups that meet after school. 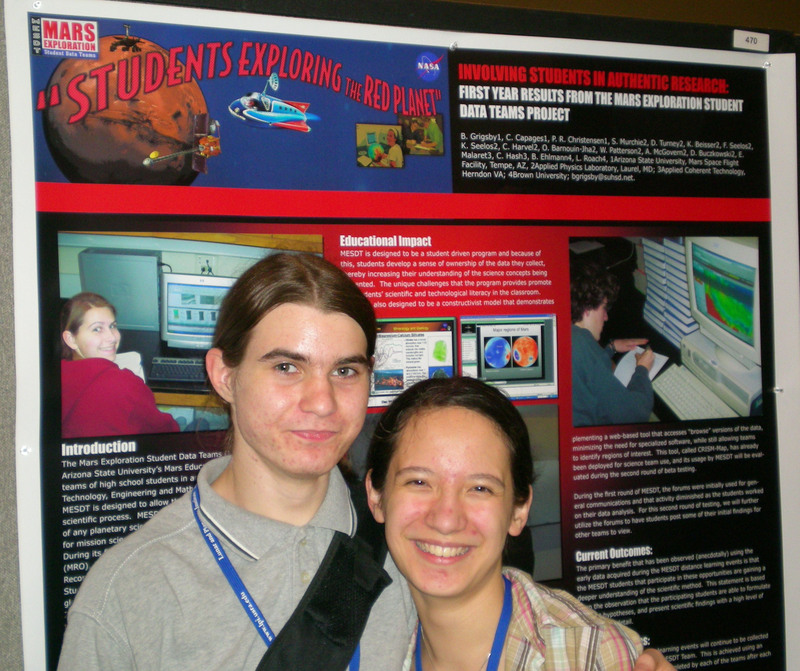 The MESDT program was created by Arizona State University’s Mars Education Program to give students the opportunity to work with scientists, mission planners, and educators on the collection and analysis of data as they are downloaded from CRISM. The MESDT 2009-2010 session kicked off at the beginning of the school year, and in September the student groups reviewed the “Mars 101” and “MESDT Introduction” presentations which were posted online by the MESDT coordinator, B. Grigsby. In October, CRISM team member D. Buczkowski met with students online to provide an overview of Mars, CRISM’s capabilities and maps, and to offer guidance for possible student research using the CRISM Map tool. 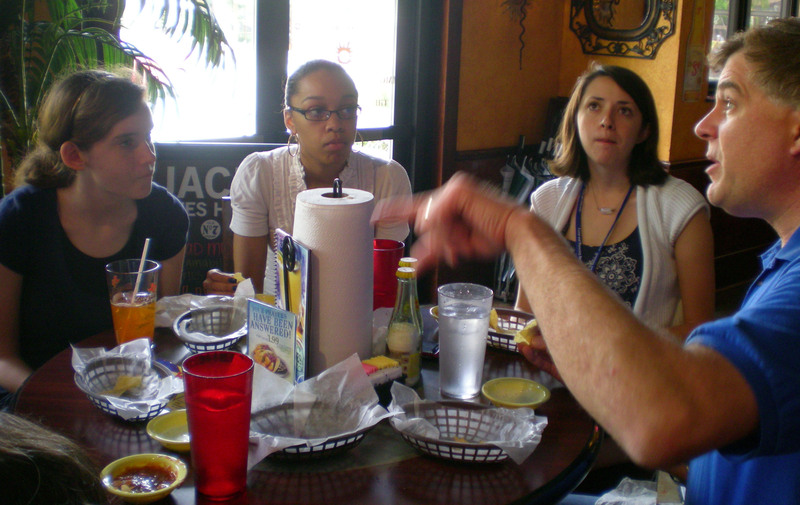 CRISM Principal Investigator S. Murchie talks with students from Durham Academy (Durham, N.C.) at the 2009 Lunar and Planetary Science Conference. The student teams then began familiarizing themselves with CRISM Map and thinking about research topics. In November, the new participants heard from some of last year’s MESDT students, who presented their own research. Teachers from the schools who participated during the 2008-2009 school year have credited the MESDT program with helping students focus and maintain their interests in science, technology, engineering, and mathematics (STEM) majors or careers. MESDT was also featured in NSTA Reports, published by the National Science Teachers Association. 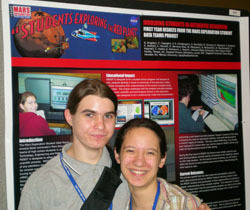 Durham Academy (Durham, N.C.) students show off their MESDT poster at the 2009 Lunar and Planetary Science Conference. For the third year in a row, students on the Durham Academy MESDT team, from Durham, N.C., are presenting a poster at the Lunar and Planetary Science Conference, March 1-5 in The Woodlands, Texas.